We have gained a remarkable position in this business and are indulged in presenting an exceptional range of Spirulina Facial Cream. This Spirulina Facial Cream is known to nourish the skin and also prevents signs of aging. Along with this, these products are thoroughly tested for quality before making final delivery. To meet variegated demands of our esteemed clients, we are engaged in trading an exclusive range of Gold Extract Facial Cream. We specialize in offering Facial Whitening Cream. - Good moisturizer without clogging pores. - Reduces water loss and balance oil production. - Reconditions, protects & improves skin's texture. The Facial Massage Cream makes the skin smooth, silky, and radiant. The Facial Massage Cream also helps to get rid of facial pigmentation and dark circles. 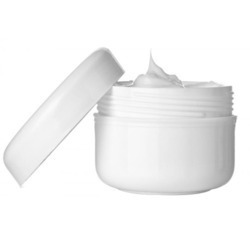 We are primarily engaged in the manufacturing, exporting, and supplying of Facial Massage Cream all over India and abroad. Our Facial Massage Cream is available at affordable prices. Facial cream for a beautiful radiant skin ideal with a cutting-edge innovation of Glutathione and Vitamin C for perfect bright and beautiful skin results. With O.D.A. White TM and Niacinamide to get a radiant skin and skin appears more consistent in color. Almond Oil: Natural emollient and an excellent skin softner. Cucumber Juice: Known for its soothing and claming effects on the skin. Contents : Almond Oil, Almond Green Extract, Vitamin E, Jujaba Oil, Cucmber Seed Extract, Avocada Fruit Oil. Usages : It Provides youthful skin & helps to remove dark circles, wrinkles and lines. Vedic Line Bio Rhythm Cosmetics includes products with Grape Seed Extracts. In France , Red Barrel Bath is suggested for defying wrinkles. Red has its own culture & rejuvenating treatments which are now appreciated world over.